22 year old Karen Technical Training Institute student, Kennedy Macharia Gichobi is among the two that emerged the winners of the Opera News App Shake and Win Campaign. Macharia won a won a brand new Renault Kwid car. 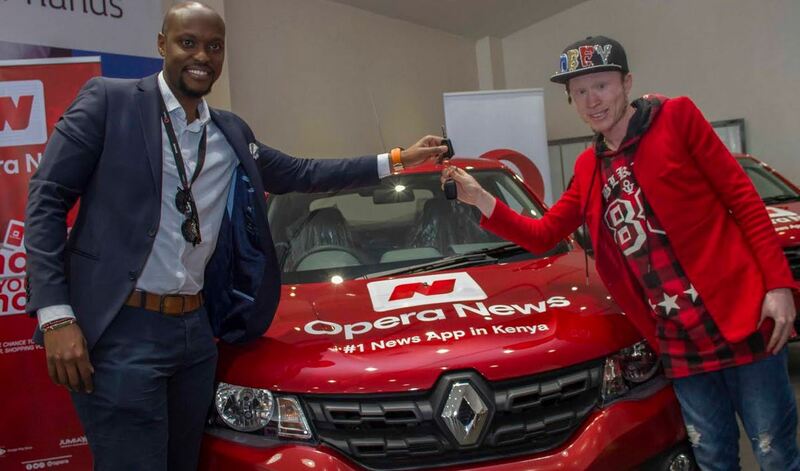 Opera News, the most downloaded news app in Africa, is celebrating the end of a fantastic football World Cup 2018 by giving away two out of three brand new cars to its users in Kenya as part of the “Shake and Win” campaign. The lucky winners, Kennedy Macharia, a twenty-two years old student, and Richard Kamau, a thirty-three year old designer and printer, were presented today in Nairobi in a private event at the Renault car dealership in the Simba Corp Aspire Centre. The news app launched a built in “Shake” feature at the beginning of the 2018 football World Cup to reward its users with gifts and prizes in an easy way. When users open Opera News and click on the dedicated World Cup channel, a shake command pops up on the screen, letting users know that they can shake their phones in hopes of winning an amazing prize. Macharia and Kamau received the keys of their band new 2018 Renault Kwid’s and shared their excitement with their families and friends who came and pick up the cars with them. Macharia, currently studying business management at Karen Technical Training Institute, mentioned that this was a dream for him. Kamau, who owns a printing business in Nairobi, mentioned that winning this car gives him a new opportunity to travel around the country with his family. Since the introduction of the Shake feature, Opera News has rewarded more than 100 thousand users in Kenya with amazing prizes. Opera News has extend the campaign and will continue giving away prizes to users in Kenya until the 31st of July, 2018.